Begonias are native to South and Central America, Africa, and southern Asia, liking the moist climate of a sub-tropical or tropical environment. This means that although the begonia is a simple plant to care for, choosing the right location and watering them properly (moist soil, but not too wet) is essential to success. 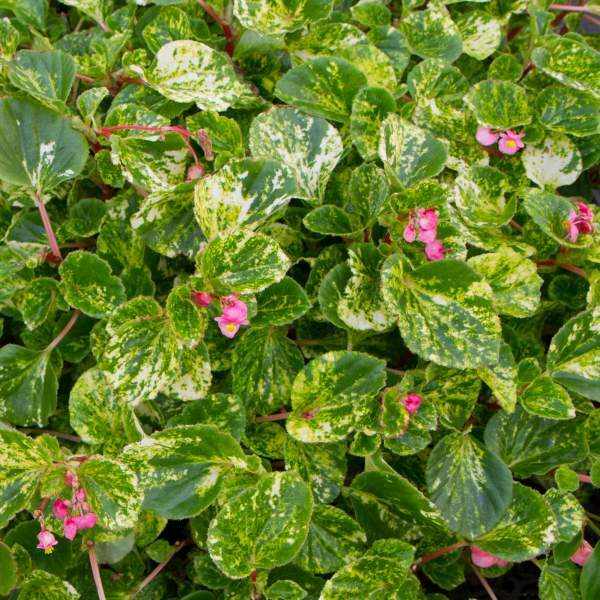 Charm begonias boast vareigated foliage wich sets them apart for seed varities. Greenhouse grown charm foliage is yellow, but in the sun they will get a red tinge with red edging on their leaves. Charm begonias have single blooms that look great all summer. They are best grown in containers as house plants or for partial shade landscape use. For best results with Charm Pink, we recommend using a constant feed program of 200 ppm N. Maintain a pH between 5.5 - 6.2. Allow soil to dry slightly between watering. We recommend that you pinch Charm Pink 5-10 days after transplanting to your final container. Additional pinches every couple of weeks may be required to shape your final pot. Remember to give your double begonias 4 weeks from their final pinch to reach bloom stage. Aphids may be a possible pest problem with Begonias. Charm Pink are not prone to many diseases, but watch for botrytis and plant rot while the days are short. Botrytis is a grey rot usually associated with wet or humid conditions. You can prevent it by allowing the plant to dry out between waterings, allowing for good airflow in your greenhouse, and spacing to allow the sun to penetrate to the soil level. The most common chemicals used to treat botrytis are Medallion and Banrot. Use them as a drench according to each label’s instructions. 2. Pinch Charm Pink 5-10 days after transplanting to your final container. Additional pinches every couple of weeks may be required to shape your final pot.